Learn more about the Hydro Massage difference. Click any icon to learn more. The idea of a relaxing soak in hot water is not a new thought. Throughout history people from many cultures have enjoyed this practice of Hydrotherapy. From naturally occurring thermal or hot springs to elaborately constructed bath houses, the benefits of hydrotherapy are well documented. Many hot springs have long histories with Native American tribes. They used these natural spas for healing and believed the waters had special powers. The Romans took it a step further by incorporating these hot spring waters into their communities. They understood the rejuvenating characteristics of hydrotherapy and enjoyed their daily soaks in the company of their friends and peers. By the fifth century there were as many as 900 public baths in Rome alone. The Greeks, Egyptians, Turks, and the Japanese all enjoyed thermal/hot springs and hot water baths as part of their social and spiritual culture. Water has healing powers. Whether still or moving, it has the ability to relax and revitalize! Contact Hydro Massage Products today to experience the difference for yourself! Over 100 available designs & options contact us and we will help choose the right solution. Our ultra-clean plumbing on our jetted whirlpool baths is the newest in technology. With features to keep your bath at it’s cleanest level, you can be sure our exclusive ultra clean will keep your bath mold and mildew free with only a wipe down – no more deep scrubbing. You want to relax in your bath, not spend hours cleaning it. Hydro Massage Products is the only bath manufacturer to offer a Stay Hot bath experience. Our Air Platinum series offer a stay hot water temperature, set to your liking, for superior hydrotherapy. Fatigue, stress, aches and pains – make them all a thing of the past thanks to the ultimate in relaxation. Our environmentally friendly eco bond green foam insulation helps our Hydro Massage baths stay warm and quiet. The eco bond green foam insulation helps keep the water hot for up to 30 minutes, while reducing energy costs and consumption by maintaining water temperature without the use of electric or natural gas heat sources. Our new all natural ReVive Oxygen Soak hydrotherapy system offers the latest in oxygen rich bathing. The beauty of our ReVive is the blanket of oxygen-rich bubbles that envelop your entire body, giving your skin a luxuriously silky feeling. By moisturizing and cleansing at the same time, your skin pores lift away any impurities found in the skin, while plumping, hydrating, and reducing fine lines and wrinkles. Our superior targeted hydrotherapy is the ultimate in relaxation. With 9-52 jets, our exclusive Sole Soother jet, and powerful pumps up to 3.25HP, you can rest assured knowing you have the best in your hydrotherapy tub. Our competitors can’t match the quality we put into each and every hand crafted Hydro Massage Products bathtub. Think you can’t have the bath of your dreams because of your floorplan? Think again. With 108 models to choose from, over 1350 packages and combinations, and four different pump locations, your bathroom no longer stands in your way. 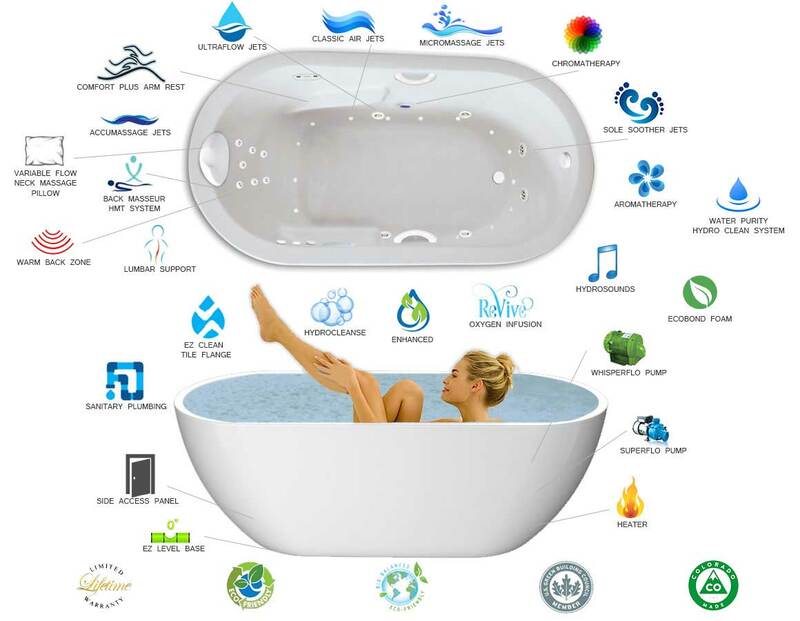 The possibilities with Hydro Massage Products baths are endless. Hydro Massage offers a home spa experience like no other. Find your bliss with available Air, Hydro, Combination, and ReVive models. Back that with our Limited Lifetime warranty on the shell, surface, pumps and blower, you have a bathing experience that will last! All without leaving the comfort of your home. 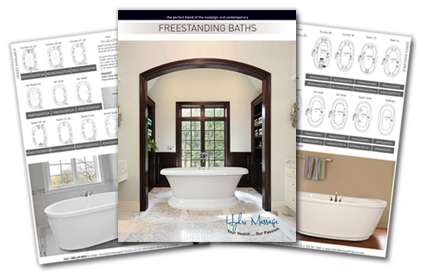 Find the bath that’s simply perfect for you!